Y’all come out to Yates Mill! The 2019 tour season will begin March 2! Plan now to bring your family, your neighbors, your out-of-town guests and all your friends to visit Yates Mill – the only remaining operable gristmill in Wake County. 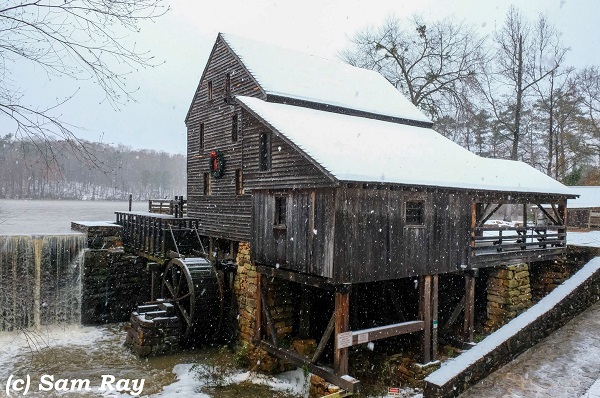 Historic Yates Mill County Park is open year-round. Drop by during daylight hours to view the changing scenery and wildlife, to take a walk around Yates Mill Pond, and to visit the displays in the park center. While you’re there, please consider making a gift to Yates Mill Associates. Your donations make it possible for us to keep Yates Mill in operating condition for our neighbors and guests to visit and enjoy. Going shopping? Will you get us a little something? Did you know your purchases at Amazon can help support Yates Mill Associates? They can if you shop through AmazonSmile, the online store’s charitable portal. Click the logo above to go directly to the Amazon logon that will connect you with our group. We hope you’ll include us in your shopping list! Yates Mill Associates is solely responsible for the maintenance, repair and upkeep of Yates Mill. You can help us keep the wheel turning by making a secure online donation right here on our website, or by downloading a form to mail a check to us. We can’t do it without you — thank you! Yates Mill is a fully restored, circa-1756 gristmill located in Raleigh, North Carolina. It is the centerpiece of Historic Yates Mill County Park, located in central Wake County. The mill is listed on the National Register of Historic Places and is the only restored, operational automatic mill in North Carolina and one of just a few in the country. Yates Mill Associates Inc. is the guardian of this unique cultural and historic site. YMA was formed in 1989 to restore, preserve and operate the mill, and we are solely responsible for funding its upkeep and repair. Yates Mill Associates developed partnerships with Wake County and North Carolina State University, the mill owner and guardian, to develop a park around this significant relic. Today, this community resource also includes the A. E. Finley Center for Education and Research, and a 174-acre nature preserve.